Helix at the plate against El Capitan on Wednesday. The Highlanders would take an early 1-0 lead in the top of the first inning on a solo home run. 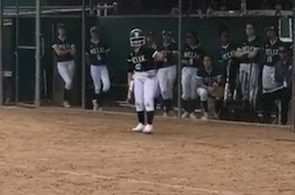 However the Vaqueros answered in the bottom of the first as Madisyn Wieher (1-1, 2R) led off with a walk, advanced to second on a passed ball and would come around to tie the game on a Katie Collier (1-3, R, RBI) laced single. Following the single by Collier, Madison Michalek-Rosales (1-3) lined a single which advanced Collier to third, she came into score on a base hit by Alexa Williams (1-3, 2 RBI) to give the Vaqueros the lead 2-1. 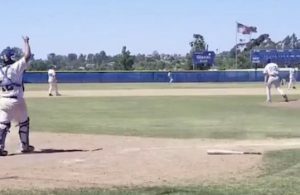 The Vaqueros tacked on another run in the bottom of the third inning as Williams reached on an error which scored Wieher, who led off with a walk. Helix trailing 3-1 in the top of the sixth inning was able to pull within 3-2 on a base hit that scored the leadoff hitter who reached on an error. 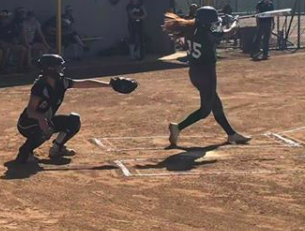 However, the Vaqueros scored an insurance run in the bottom of the sixth with two outs as Kylie Mead (1-3, RBI) singled to score Brooklyn Fukushima to make it 4-2. 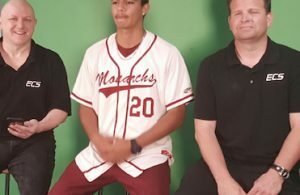 Garnering the victory for the Vaqueros was Mead who went the full 7 innings, giving up 2 runs of which 1 was earned on 4 hits while walking 0 and striking out 4. On a day when the Norsemen would pound out 14 hits their pitching led by Delaney Stettler was just as dominant as she only allowed one hit on the day. The bats for the Norsemen got going in the bottom of the first when Jade Hill (2-2, R, SB) led off with a single and would score on a double by Rachel Shelstrom (2-2, 2R, RBI, SB) to make it 1-0, she would steal home to make it 2-0, Samantha Green walked, Zoe Glenn into run, she stole second and advanced to third on a Victoria Villegas groundout, Stettler (1-3, R, RBI) laced a single to score Glenn (2R, SB) making it 3-0, Rylee McMillan (1-1, R) singled and would score on a Kelly Olson base hit to make it 5-0 which also scored Stettler. Valhalla added more in the bottom of the second as Kennedy Labshere (2-3, R, RBI, 2B) doubled to score Shelstrom and Green reached on an error that scored Labshere to make it 7-0, Olson would later knock in a run to make it 8-0. Valhalla would round out their scoring in the bottom of the fourth inning as they scored three runs. 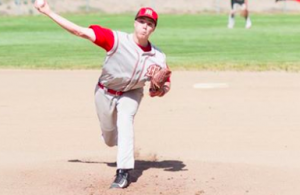 Stettler garnered the victory for Valhalla going 5 innings giving up one hit and striking out 2.